Conservative dentistry is that discipline of dentistry that deals with the diagnosis, treatment and prognosis of decayed, discolored and fractured teeth and at the same time conserving as much tooth structure as possible. Endodontics deals with the diagnosis, prevention and treatment of diseases of pulp (nerves and blood vessels inside the tooth) and bone around the root of teeth. The department started in 1986 and post graduation in the specialty was started in May 2007. 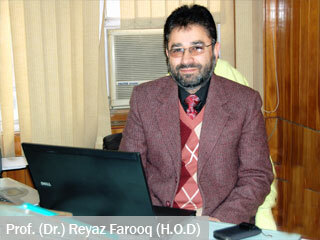 The department presently takes two students each year for the post-graduation which are selected by the BOPEE Jammu and Kashmir. The Conservative and Endodontic Department of Government Dental College Srinagar is one of the basic departments that receives and delivers treatment to nearly 200 patients on daily basis at the undergraduate and post graduate level. There are separate undergraduate and postgraduate clinics. The undergraduate clinic is equipped with electronic dental chairs which are supported by state of art sterilization equipments. The department has a separate post graduate clinic with state of art gadgets like diagnodent, cordless RVG, endomotors, thermoplastic obturation systems, bleaching lights, lasers, magnifying loupes. In addition the department has a fully functional independent ceramic lab containing equipments like porcelain furnace, induction casting machine, sandblasting machine, die fabrication system and vacuum investing machine. The department has a fully operational specialty and endodontic surgery clinic which is used by the residents and post graduate students of the department to treat challenging cases. The department has very good strength of experienced, skillful and dedicated teaching staff which is headed by the Principal/Dean of the college to guide and train the UG and PG students in the specialty of Conservative Dentistry and Endodontics. To educate and impart best knowledge to its students in the subjects of Conservative Dentistry and Endodontics, train them in clinical work to achieve excellence at the undergraduate and postgraduate levels to be able to render good services and optimal care to the patients. To enhance skills and encourage research oriented studies by the postgraduate students of the department. To effectively diagnose and render treatments under the supervision of the faculty members to the hundreds of patients that are referred to the department every day. The department offers direct restorative treatments like Amalgam, Composite and GIC fillings at the undergraduate and post-graduate clinic besides the root canal treatments of the teeth. The department offers treatments like indirect restorations of decayed teeth like inlay, onlay, laminates, post & core restorations indigenously fabricated by the PG students of the department. The postgraduate students delivers root canal treatments of special or difficult cases by using latest gadgets available in the department like electronic apex locators, ultrasonic inserts etc. The endodontic surgeries are done in the department by the postgraduate students and the faculty in the state of art endodontic surgery clinic equipped with soft tissue laser. Full mouth rehabilitation and esthetic restorative treatments for hypoplastic teeth besides the non vital and vital bleaching treatments are offered by the department at the PG clinic. The emergency management of fractured teeth in trauma related cases are routinely done in the department like splinting, reimplantations for avulsed teeth etc. Post-Graduation courses have been going on since 2007 and till now 8 students have pursued their MDS from our department. Hands-on Course on ‘COMPONEERS-UNLIMITED POSSIBILITIES’ on 5th July 2013 in our institution. The Effect of File Size in Presence of Sodium Hypochlorite,Saline and Blood on the Accuracy of Elements Diagnostic Unit;An In-vitro Study. Radix Entomolaris with a Bilateral Occurrence;A Case Series. Endodontic Management of Maxillary 1st Premolar with Three Roots;A Report of Two Cases. 2010 Volume 9 Number 1. An Vitro Study to Determine the Dissolving Efficacy of Different Organic Solvents on Gutta-Percha and Resilon Root Canal Obturating Materials at Different Immersion Time Intervals. Root Canal Systems of Maxillary 1st Permanent Molar Teeth in Kashmiri Population-An In-Vitro Study. Medicaments from the Root Canal-An In-vitro Study. A Comparative Evaluation of Surface Changes and Incidence of Separation of NiTi Instruments Under SEM-An Invitro Study. To Compare and Evaluate Shaping Ability of Three Different NiTi Rotary File Systems in Root Canals of Extracted Molar Teeth-An In-Vitro Study. To Compare and Evaluate the Efficiency of Smear Layer Removal between Diode Laser and Ultrasonics with or without EDTA.